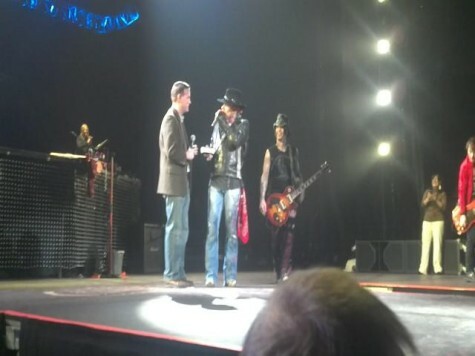 Guns N’ Roses leader Axl Rose hooked up with the Mayor of West Valley City at the band’s Tuesday night concert in the Utah city. The Salt Lake City Tribune reports about one hour into the show at the Maverik Center, Mayor Mike Winder stepped onstage and greeted Axl. Winder congratulated the band on this past week's announcement that GNR had been inducted into the Rock and Roll Hall of Fame, and presented Rose with a key to the city. "How long do you stay open?" Rose asked the mayor. Turns out the Mayor was right, as GNR hit the stage around 11 p.m. and delivered a 3-hour set, wrapping things up just after 2 a.m.
Read the full concert review at the Tribune here.